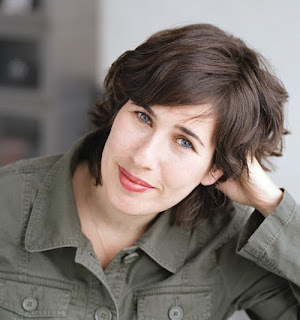 I always bond with other Algonquin writers, and I loved Lauren Grodstein's writing long before I ever met her. Smart, funny, and profoundly honest (You can talk about your deepest fears with Lauren and get exactly the response you want and need), Lauren is also a knockout writer. 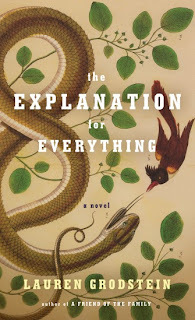 Just take a gander at her new novel, The Explanation for Everything. What is the real meaning of life? What do we really believe? How, when and why should we forgive? These are just some of the powerful themes winding through the book. Biologist Andy Waite is haunted by the death of his wife, but when he takes on a young evangelist as an independent study student, he begins to question everything around him, and his personal and professional ground begins to earthquake. A provocative and thrilling novel about what we choose to believe and whom we choose to forgive, and how those choices shape our very lives--and the lives of others. Lauren is also the author of the New York Times bestseller, A Friend of the Family, Reproduction is the Flaw of Love, as well as the short story collection, The Best of Animals. Her pseudonymous Girls Dinner Club was a New York Public Library Book for the Teen Age. She teaches creative writing at Rutgers-Camden where she helps administer the college's MFA program. I couldn't be more jazzed to have Lauren here. Thank you, thank you, Lauren! So much of this brilliant novel is about how what we believe becomes, in a sense, who we are, and as we change, so do our beliefs. Can you comment about that? And why and how do you think belief works for some people and not for others? As much as anything, I think the capacity for belief comes down to temperament and upbringing. I wrote this novel after ruminating for years, really, over a series of conversations I had with a beloved student who was, and is, a devout Christian. This student was smart, savvy, sophisticated, experienced in life – in other words, she wasn’t easy to dismiss. I respected her enormously and still do. And yet, soon after we met, she informed me that she believed that the Bible was the literal word of God, and she believed that the earth’s age could be calculated according to Biblical math (I think she thought it was about 6,000 years old). You can only imagine how frustrating it was for me, her teacher, to argue with her over what seemed to me to be such an utter rejection of science, knowledge, modernity – such an utter rejection of the truth! (Naturally she felt similarly toward me). One day I said to her that I imagined if she had grown up in my Jewish-leaning-toward-atheist family in the Northeast and I had grown up in her very very Christian family in the Midwest, we might believe what the other did. She disagreed; she said that no matter where she was born, and to whom, she would have found her way to God. She might be right, but I’m pretty sure I am. I’m really curious what the research was like. Did you talk to evangelicals? To evolutionary scientists? And do you think the chasm between them can ever really be bridged? The research was intense. I started with a year of reading – this was easy and fun to do because a) reading is so much more pleasant than writing and b) it was great to dig deep into subjects that really interest me. And also it was good to spend a year that way because my son was still not exactly sleeping through the night, so I’d sit up, nurse him, and read. Some of my favorites from that year include Darwin’s The Voyage of the Beagle and On the Origin of Species, Richard Dawkins’s The Selfish Gene, Francis Collins’s The Language of God, and Daniel Dennett’s Darwin’s Dangerous Idea. Once I finally started to write, it became clear I needed to see some scientists in action. This is where my affiliation with Rutgers came in handy; not only was I able to interview campus biologists, but I got to tour the labs, see the rodents, and get vivid (too vivid!) explanations of the kinds of experiments they run. I hired a grad student to fact-check my science for me, and he called out the myriad things I got wrong. As for whether the chasm between Darwinists and Creationists can be bridged, I sometimes doubt it. The two camps seem to live in parallel cultures, both angry about the other sides’ perceived attacks. I’m an atheist who believes in science, who believes that scientific research is the engine of human advancement. But I also believe in wonder, and that the capacity for wonder brings about great joy. And religion itself is an enormous source of wonder and joy for so many – how can I dismiss that? Why would I want to? Just because I don’t share those beliefs is no reason for me to discount them in others. And finally, do you think science will ever find an explanation for everything? Some scientists have postulated that the need for religion is in our DNA, hardwired as a biological helpmate for us. Care to comment? I think that evolution, or evolutionary theory, is probably part of the explanation for everything. I also think much about us is genetically predetermined, including, perhaps, religiosity. But I don’t know enough about the science to say more than that. To me, a lot of the book is also about the cost of forgiveness--both for ourselves and for others. It’s one of the issues that Professor Waite grapples with, and which you resolve in an unexpectedly moving way. Did you always know that ending? That’s exactly what the book is about! Even more than faith, this book is about forgiveness, and about the realization that the worst thing that’s ever happened to you is not the worst thing that’s ever happened to anybody. I was inspired, too, by this story I love, Swimming, by T Cooper (which couldn’t be more different from my novel in tone, setting, plot, all of it) – Swimming revolves around this guy who made the worst mistake a person could make and is determined to live the rest of his life feeling sorry for himself and refusing all human connection. But over the course of the plot, he realizes that other people have suffered even more than he has and still insist on living life, on being human. And it’s this realization that I find so crucial. How do we acknowledge suffering in others? How do we forgive others for what they’ve done to us? Is faith a path to that recognition and forgiveness? It is to some – and for others, life experience in itself provides that path. And of course, for too many of us, other peoples’ lives and journeys and needs never get acknowledged at all. Let’s talk about craft. How much did you know before you started writing The Explanation for Everything? Did you outline or fly by the seat of your pen? I always make these crappy little outlines just so that I feel I’m writing toward something – and so I have something to fiddle with when I procrastinate. But honestly my outlines got scrapped and scrapped again while I was working on this novel. I did write toward a moment - when Andy mails a letter to the drunk kid who killed his wife. I thought that might make for a nice closing scene. But how he was going to get there, to that mailbox, I wasn’t really sure til I actually wrote thoe paragraphs. In books or in life? In books, I am so obsessed with Jane Gardam’s Old FILTH trilogy (FILTH stands for “Failed in London, Try Hong Kong”) which lots of people have read but even more people should. It’s my favorite kind of storytelling: dry, surprising, told from all sorts of angles, full of good British manners and bad British weather. In life I’m obsessed with getting my son through his first weeks of kindergarten while also being far away on book tour. Next week we’re supposed to turn in these forms saying who will pick him up when: for instance, Mondays, mom, Tuesdays, mom, Wednesdays, mom. Etc. But of course my form says: Mondays, babysitter, or maybe a neighbor, or maybe dad if he gets there on time, and then Tuesday, I have no idea, and then Wednesday, panic. Please don’t call family services. Ahem. Well, people often ask me how I feel about the future of publishing and e-books and that sort of thing. I feel good about it in some ways (lots of ebooks promise lots of readers) and bad in others (what booklover can’t help but worry for the endangered bookstore?) But I will say that with every novel I publish, I feel so very blessed, so very lucky, for anyone to read my work at all. I don’t care which format they choose. I don’t care how they found the book in their hands. I just love being a writer, and I love every reader who makes it possible for me to keep writing. Thanks you Caroline!! I've been eyeing Lauren's book for a while, and now I'm pushed more towards reading it soon!! Ahh, so many books! Wonderful interview and love learning about authors process etc.